Small diameter cut-off wheel for circular saws and grinders. 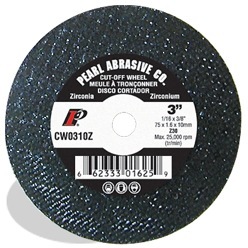 Pearl offers a wide variety of grain configurations to meet all possible cutting requirements. Each wheel is fully reinforced and designed for long life and fast cutting performance. Available sizes 2" to 20" diameters.